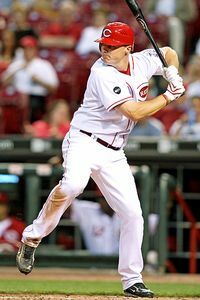 Few players in all of baseball are more talented than the Cincinnati Reds’ 24-year old right fielder Jay Bruce. Before his first big league season in 2008, Bruce was rated the top prospect in the minors by Baseball America. He had a decent rookie year, batting .254/.314/.453 with 21 home runs and 52 runs batted in. However, he took a major step back in his sophomore campaign, hitting .223/.303/.470 with 22 homers and 58 RBIs only to rebound to have a good year last season. In 2010, Bruce set career-highs with .281/.353/.493 batting line, 23 doubles, 25 home runs, 70 RBIs and 58 walks, helping to lead Cincinnati to the National League Central title and their first playoff appearance since 1995. After a rollercoaster beginning to his career, the Reds expected a more smooth year from Bruce in his fourth season in the major leagues to help defend their division crown. On the outside, it looks as if he has improved on his performance from 2010. He is batting .274/.352/.516 with 23 doubles, 26 homers, 80 RBIs and 52 walks in 117 games. However, like he has had up-and-down years in his career, Bruce’s season has seen wildly inconsistent swings in his production hitting behind reigning MVP Joey Votto in the Reds lineup. In the first month of the season, Bruce got off to a slow start, batting .237/.306/.381 with two doubles, four home runs and 11 RBIs. As the calender flipped to May, Bruce’s bat became a lethal weapon for Cincinnati. In a 34-game stretch from May 1 through June 7, he batted .343/.405/.709 with eight doubles, 13 homers and 35 RBIs. With opposing pitchers more wary of Votto this season, who walked 33 times in that span, Bruce made them pay for pitching around Cincinnati’s first baseman. As a result to Bruce being able to drive in runs and take some of the offensive load off his shoulders, Votto could be more selective at the plate because he knew a red-hot Bruce behind him would take care of business if he did not. Votto’s numbers reflect that, as he batted .310/.439/.452 with seven doubles, three home runs and 22 RBIs during that span. Just like that, though, over the next month Bruce struggled mightily at the dish. In 26 games from June 8 through July 7, he hit .158/.245/.274 with only five doubles, two home runs and eight RBIs. He did not provide much protection for Votto, who got even less to hit during this month, causing Votto to try to swing at pitches he otherwise would not have because the Reds were needed more production from the middle of its order to stay afloat in the NL Central race. Votto’s numbers also dipped during this time, batting .283/.358/.434 with four doubles, four homers and 14 RBIs. Bruce’s rollercoaster ride of a season naturally led him to heat up again at the plate. In his last 32 games (from July 8 on) he is hitting .324/.417/.611 to go along with eight doubles, seven home runs and 26 RBIs. Providing ample protection for Votto has allowed the Reds’ first baseman to be more selective once again and not feel the pressures of carrying an offense. In the same span as Bruce, although Votto has played in 33 games, Votto has hit .317/.420/.583 with 11 doubles, seven home runs and 20 RBIs. With Bruce hitting well once again behind him, Votto has been making the most of the increased amount of pitches to hit he has been seeing. 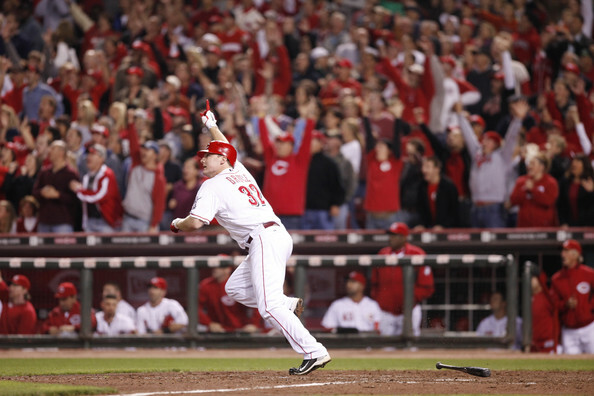 On the outside, Jay Bruce looks to be enjoying an improved season from how he hit last season. However, similar to how his career has had up-and-down years, Bruce has had rollercoaster production that seems to vary each month of the 2011 season. When he has been hot, his presence behind Joey Votto in the Reds’ lineup has allowed Votto to be more selective at the plate because he faces less pressure from the shared load of carrying Cincinnati’s offense. It also forces pitchers to give more to hit to Votto because they don’t want to face Bruce with Votto earning a free pass to first base. On the contrary though, when Bruce is struggling, Votto sees even less to hit, and with Bruce not helping him in the middle of the order, the responsibility to score runs often falls on Votto, who feels he must swing at pitches he otherwise would not have to make something happen for the Reds on offense. At 24 years old, Bruce has certainly made strides to fulfilling his potential and becoming a staple in the middle of the Reds’ order. This season has shown that Cincinnati’s offense and Joey Votto, their best player, go as Bruce goes. Bruce must avoid such low valleys and become more consistent at the plate to give ample protection to Votto and provide Cincinnati with two dynamic hitters in the middle of its order. This entry was posted on August 18, 2011 by Scott Kornberg. It was filed under Cincinnati Reds, Jay Bruce and was tagged with cincinnati reds, Jay Bruce, joey votto, reds, Scott Kornberg.